The UN General Assembly overwhelmingly approved a resolution on Thursday to upgrade Palestine to a “non-member state” at the United Nations, implicitly recognizing a Palestinian state. Addressing the assembly in New York ahead of the vote, President Mahmoud Abbas said the UN bid was the last chance to save the two-state solution. The president told the UN that Israel’s war on Gaza highlighted the urgency of ending the Israeli occupation. “It also reaffirmed the Israeli government’s adherence to the policy of occupation, brute force and war,” he said. “We’ve listened for the last months to the incessant flood of threats in response to our peaceful, political and diplomatic request in the UN and have watched (Israel’s) war on Gaza,” Abbas said. Israeli premier Benjamin Netanyahu immediately condemned Abbas’ speech as “hostile and poisonous”, and full of “false propaganda”. “These are not the words of a man who wants peace,” Netanyahu also said in a statement released by his office after Abbas spoke. US Secretary of State Hilary Clinton called the vote “unfortunate and counterproductive,” saying it puts more obstacles on the path to peace. The move falls short of full UN membership which needs sanction by the Security Council, where the US wields a veto. But it allows Palestine access to the International Criminal Court and other international bodies. Thank goodness the U.N. members voted this way, viva Palestina. Hopefully we will see some more positive changes. Congratulations from the people of Canada. Please believe me that our idiotic federal government does not represent the majority of people in this country today. We seem to be a USA stamp of approval machine lately. Sorry. I hang my head in shame today from our UN ‘no’ vote. But none-the-less, I am so happy Palestine became properly recognized today, it is about flipping time!!! In-fact, I was really surprised of the Canadian position. I Love Canadian People, and I believe you. Peace, Freedom & Long Life to both side: Israel & Palestine. What a joke. As Abba Eban once noted, if the Arabs proposed a resolution in UNGA that sky was black by day and blue by night, and that the Jews are to blame, or wtte, they’d get a 2/3 majority. That’s what we’ve seen today with a few spineless European countries joining the circus. I suppose now we await the battle, Syrian style, over who runs the PA mafia, Abbas terrorists or Hamas terrorists or maybe Islamic Jihad terrorists. Hopefully Israel will now annex major settlements and put that issue to bed. 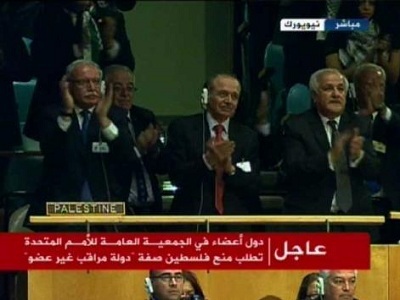 At long last the State of Palestine has been recognized by the UN. Congratulations to all of the Palestinian people. I feel ashamed to be Canadian knowing that our Federal government voted against the resolution. However many Canadians support your cause and I am definitely one of them. One very happy day for me and for lots of people around the world. Congratulations Palestine, or shall I say Mabruk? Desde la Ciudad de México envío un abrazo fraterno al pueblo Palestino incansable reivindicador de la dignidad humana, defensor de su futuro con corazón, que no sólo vive, sino que es ejemplo de cómo honrar la vida.